ROYAL OAK, Mich., January 31, 2019 – Royal Oak-based law firm Howard & Howard has donated $12,500 to the Jamie Daniels Foundation to provide support for individuals and families dealing with opiate addiction. The Jamie Daniels Foundation was created by Ken Daniels, play-by-play announcer for the Fox Sports Detroit Red Wings TV broadcasts. Daniels and his family established the Jamie Daniels Foundation in honor of his late son, Jamie, who died from an overdose at the age of 23 while receiving treatment for addiction. 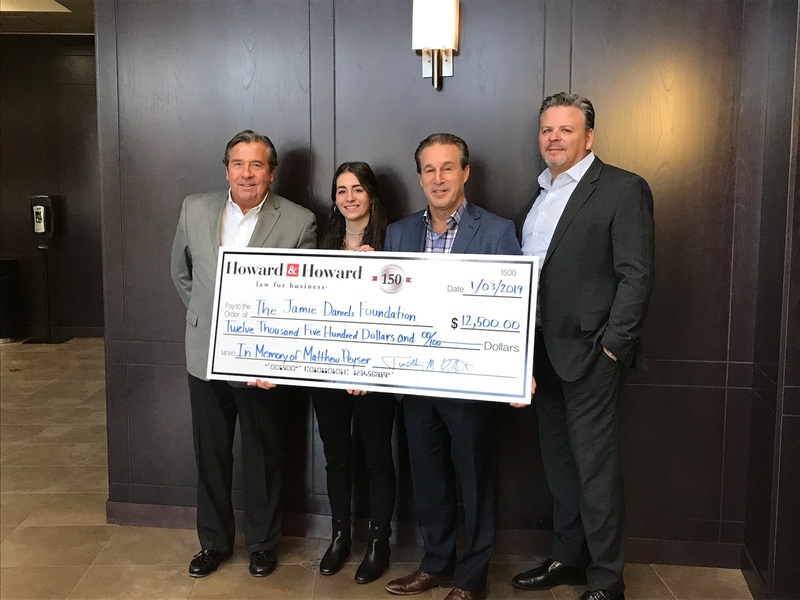 The donation is part of the Howard & Howard’s “12 Months of Giving” initiative, a year-long charitable campaign involving all of the firm’s offices and their respective communities. As part of its 150th anniversary, Howard & Howard will work with various community and charitable groups in Michigan, Illinois, and Nevada, volunteering and donating $150,000+ throughout the year. The donation to the Jamie Daniels Foundation was made official in a recent ceremony at Howard & Howard’s Royal Oak office. Pictured l-r are: Mark Peyser (Howard & Howard); Arlyn Daniels (Children’s Hospital of Michigan Foundation marketing intern and Ken’s daughter); Ken Daniels; and Tim Wittebort (Howard & Howard). The Jamie Daniels Foundation, in partnership with Children’s Hospital of Michigan Foundation, supports individuals and families who are struggling with addiction by providing the education, resources, and support they need to make recovery possible. The foundation is working together with leaders in the addiction-recovery field to create resources and programs that make it easier for families to navigate the road to recovery. More at jamiedanielsfoundation.org. Celebrating its 150th anniversary this year, Howard & Howard is a full-service law firm with a national and international practice, providing legal services to businesses and business owners. With more than 160 attorneys, the firm has offices in Michigan (Ann Arbor and Royal Oak), Illinois (Chicago and Peoria), Las Vegas, Nevada, and Los Angeles, California. For more information, please visit howardandhoward.com.